With Heroes of the Storm's launch date of June 2nd approaching, there are bound to be plenty of newcomers interested in trying the game. I've been playing MOBAs for over a year now, but I still remember how intimidating the genre can be for new players. With that in mind, this article will focus on easing new players into the game by teaching them the basics of a couple of heroes of every role that work great for beginners - and that can also be devastating in the hands of experienced players. Muradin is classified as a warrior in Heroes of the Storm, which means his role is to protect his teammates, crowd control enemies, and initiate team fights. If you've played World of Warcraft or another MMO, then you can think of Muradin as a tank. In fact, Muradin is one of the tankiest heroes in the game with strong CC, high survivability, but relatively low damage output. Muradin's gameplay mechanics are fairly straightforward and simple to learn, but deep enough that he doesn't feel boring to play even at higher levels. Like most heroes, Muradin starts out with three basic skills that he can upgrade through talents which are gained at key level intervals. His Q ability is Stormbolt, a short range skill shot that does a small amount of damage and stuns the target for a short period of time. Effectively using your Q is key to playing Muradin because the stun is great for interrupting channeled abilities or locking down targets for your damage-dealers to burn down. Thunderclap, Muradin's W ability, is an area of effect that damages and slows all enemies it hits for a few seconds. The AoE component makes this skill useful for both team fights and clearing minion waves in the early laning stage of the game. Like with Stormbolt, the damage isn't as important as the slowing effect, which can be used to cut off a weakened enemy's escape. Dwarf Toss (don't tell the Elf) is Muradin's E ability and is a short range jump that can be used as a gap closer or an escape. I mentioned above that one of Muradin's roles was to start team fights, and that is where Dwarf Toss comes in real handy. This ability allows him to leap into the middle of the fray, chase down escaping targets, and leap back to safety if he takes too much damage. Speaking of taking too much damage, one of the great things about Muradin is that thanks to his passive trait, Second Wind, he won't be out of the fight for very long. Second Wind is what makes Muradin such a great tank, because once he is out of combat for a few seconds, he begins regaining health at a very fast rate. Moreover, that regain rate is doubled if Muradin is below a certain health threshold. Muradin's fourth ability is his heroic ability and is unlocked at level 10. 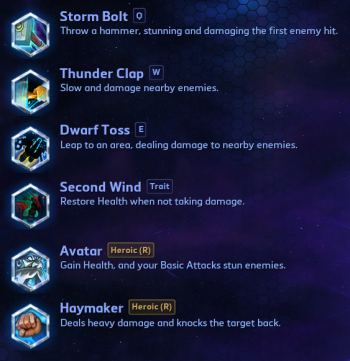 Like all heroes, Muradin has a choice of two heroics: Avatar or Haymaker. For new players, I highly recommend going with Avatar because it greatly increases his survivability and makes his basic attacks stun for the duration of the ability. The stuns themselves are barely noticeable in terms of duration, but they are great for interrupting channeled skills such as Valla's Strafe ability or Azomdan's All Shall Burn. Avatar takes everything that Muradin is good at and makes him even better at it for the duration of the ability. Haymaker is not a bad ability, but it's a bit harder to use and I don't think it fits Muradin's role as well as Avatar does. I will say that according to what stats we have, the win rates for the two skills are very close, but Avatar is by far the more popular of the two heroics. I touched upon Muradin's talents during the discussion of his ultimate abilities, but they are worth discussing a bit more in depth here. However, I will not be going into a full build simply because builds can and should change over the course of the game's life and even over the course of an individual game. In general, and especially if you are new to the game, I recommend building Muradin's talents to make him as tanky as possible, so talents that increase his self-healing or damage reduction such as Third Wind or Stone Form are always strong choices. That said, there are a few talent tiers that could use a more in-depth look. Level 1 is one such tier because there are several good choices here. The two I use the most are Block, which reduces basic attack damage by half, or Infused Hammer, which helps to offset the mana cost of your Stormbolt. In general, I go with Infused Hammer, but if you're going up against a hero that does heavy, but slow, auto-attack damage such as Sgt. Hammer or Nova, then Block can really help you stay in the fight. At level 13, you face another difficult decision, since there are several strong choices at this level. Spell Shield is basically Block for ability damage and is always a safe choice. Healing Static improves your Thunderclap by adding a healing component. Thunderstrike greatly increases the damage of Thunderclap and can be a good choice if your team has multiple warriors on it, but since it only triggers when the ability hits only a single target, it can be a bit unreliable in team fights. You can't really go wrong at level 20 as all of your options are good ones. The upgrade to Avatar, Unstoppable Force, is a really strong choice. Hardened Shield is an activated ability that greatly reduces the damage Muradin takes, so it can really add to your survivability. But honestly, I think that Muradin has enough sustain that he can get by without it unless he is getting focused by the enemy team. Your third option is Rewind, which resets the cooldowns on all of your basic abilities and is my personal favorite. However, knowing when to use it can be a bit tricky for new players to figure out so honestly I feel that Unstoppable Force is the safest bet.